I was in need of a new mascara, I needed something I could get on the High Street, as I'd decided that day that I needed a new one and I needed it NOW! 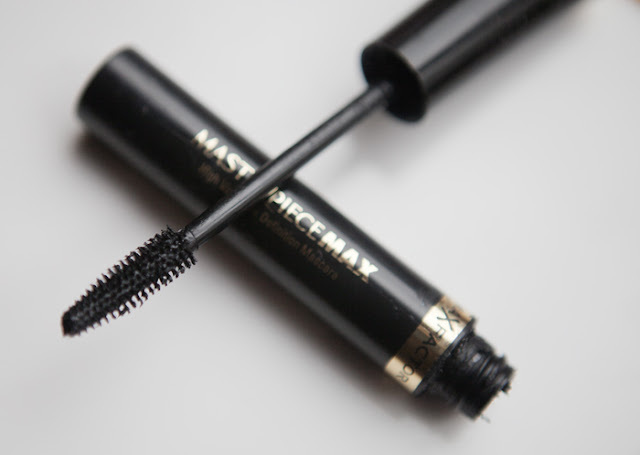 As I browsed through the make up shelves of Boots, I remembered a rave review I'd read about Max Factor Masterpiece Max - how it gave big, dramatic, lashes - so that was that. My new mascara. It does deliver on the bold lash front, but I find it reeeealllly hard to work with. It's very wet, so you have to be careful how you apply it or it ends up under your eyebrows. I also seem to constantly end up with mascara along my eyelid which I gather is due to the design of the wand. While I was applying the mascara for this pic, I ended up with some on my eyelid - I tried to sort it out but in doing so managed to stick loads of lashes together where they were so wet. When I then tried to comb through them again with the wand, they looked so ridiculous I had to remove all my make up from one eye and start again. Not so handy when you're in a rush in the mornings. My lashes definitely look more voluminous using Max Factor Masterpiece Max, whether or not they're 400% more voluminous I couldn't tell you but there's definitely an essence of drama to them now. The other good thing about it is that it really does last all day long without flaking or giving me panda eyes. I've used it for a good few weeks, so it's not even as if I need to get used to working with the formula... I just don't think it's for me. I'm totally in love with their false lash effect fusion. I'd even go as far as to say it's the best ive ever tried. Must admit I preferred the original MF Masterpiece over the Masterpiece Max. Not sure if it's still available? Would love to try the False Lash Effect Fusion too! I will keep an eye out for the False Lash Effect Fusion - is it *wet* though? what kind of eyeshadow is that? it is beautiful! WIN! A pair of RayBan Erika Sunglasses!